I am back home in Wrocław after ASUG SAP BusinessObjects User Conference (SBOUC) in Orlando, USA. Three and a half intensive days, yet I still feel like there was not enough time to discuss everything with everyone. But the first SAP InnoJam is just around the corner, so the time to pack and see folks again will come soon. For the moment, let me go back to SBOUC to share highlights of the last two days. In my previous post, I mentioned about the importance of face to face interactions. Social networking tools – no matter if we like them or not – play their important role too. When during his Thursday’s keynote Don Tapscott asked how many in the audience are using Twitter, about one third raised their hands. I am not an addicted fan of Twitter, but it became a handy tool for me. I don’t like the one player dominance on the market, I wish App.net, Path and alike good luck. Just remember “A fool with a tool is still a fool”. And remember there are different kinds of “smarts” too. There was a moment, when spammers found that #SBOUC is trending on Twitter, and started their attack. First time I saw something like this (see picture). New tweets and handlers were coming faster than you were able to get what’s going on. 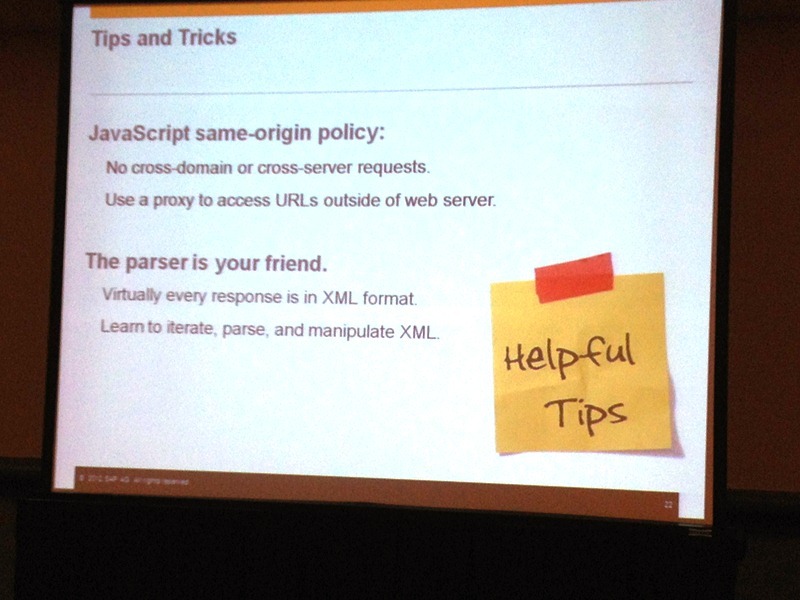 My session was obviously on the topic of SAP HANA. It was an updated version of the last year’s session, but now with the focus on where and how you can learn more about in-memory data management and where you can practice to gain hands-on experience. If SlideShare content is not properly shown as embedded above, you can review it directly here. 30-days Test&Evaluation access to pre-configured virtual desktop hosted by CloudShare. The benefit of that option is that the desktop has as well popular and new SAP BusinessObjects BI tools: Explorer, Analysis for MS Office, Visual Intelligence. Free developer edition of SAP HANA database hosted in the cloud. For the moment the only choice is Amazon WebServices. Our Developer Experience team as SAP is responsible for Developer Center. One of our new projects is to add BusinessObjects to the family of DevCenters. If you have any suggestions or comments on BObj, HANA, Sybase or any other SAP technology on the Developer Center – please let me know in comments, via twitter @Sygyzmundovych, or just by sending old good e-mail to my SAP address. It became usual to hear (mostly from the same people) that SAP’s innovations focused only on SAP HANA. 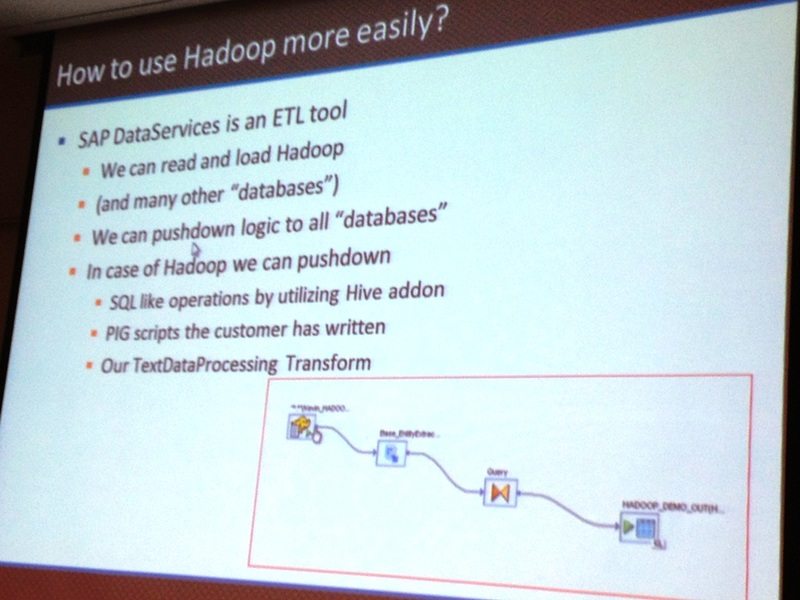 Well, there were very good sessions during SBOUC showing integration of SAP Analytics products with Hadoop too. 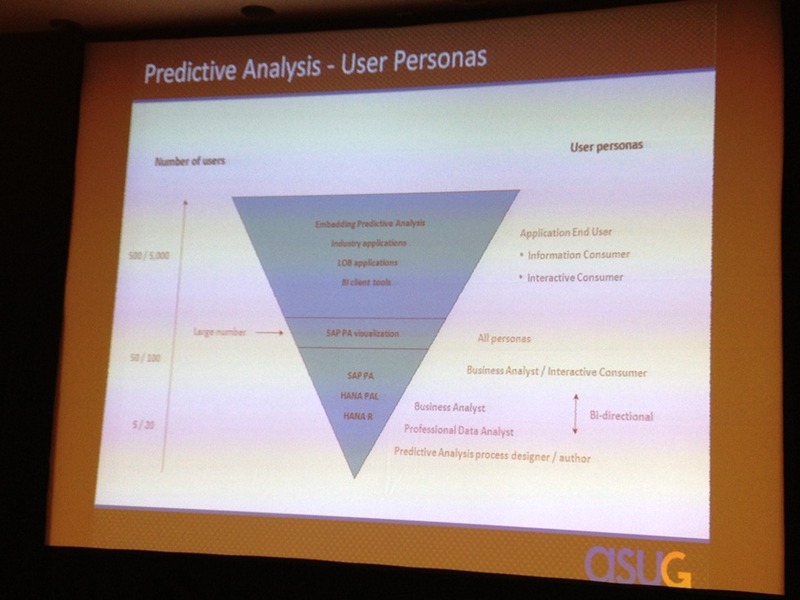 Below are some captures with session numbers, so you can download full sessions from ASUG Online yourself. Another topic interesting for me was the custom development with SAP BusinessObjects. Unfortunately not many people are aware of SAP BO SDKs and APIs, and even at SBOUC there were only two sessions on this topic. I hope to promote and to see more next year. Unfortunately, because of my flight schedule I attended only one session during the SAP Analytics Forum at the day 4 of the conference. 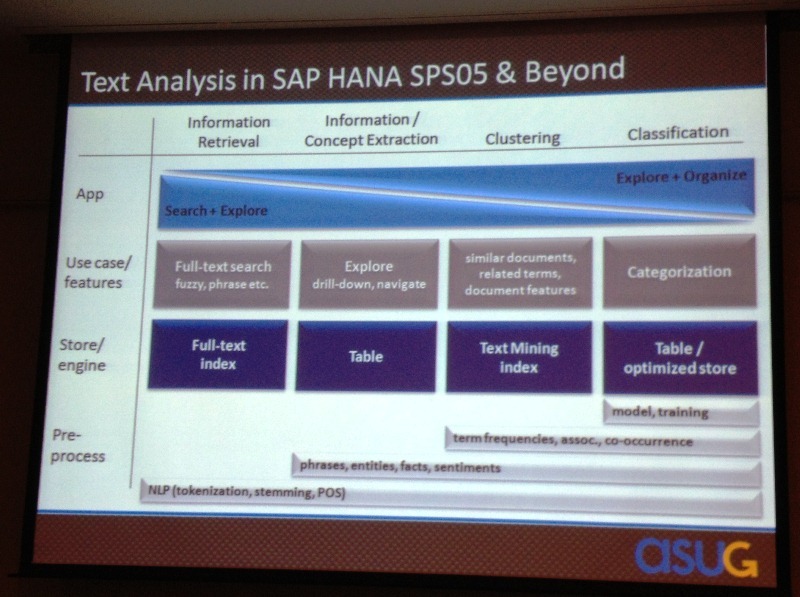 The session was Deloitte’s internal implementation of reporting using Crystal Reports and SAP HANA. Nothing speaks better than an example. 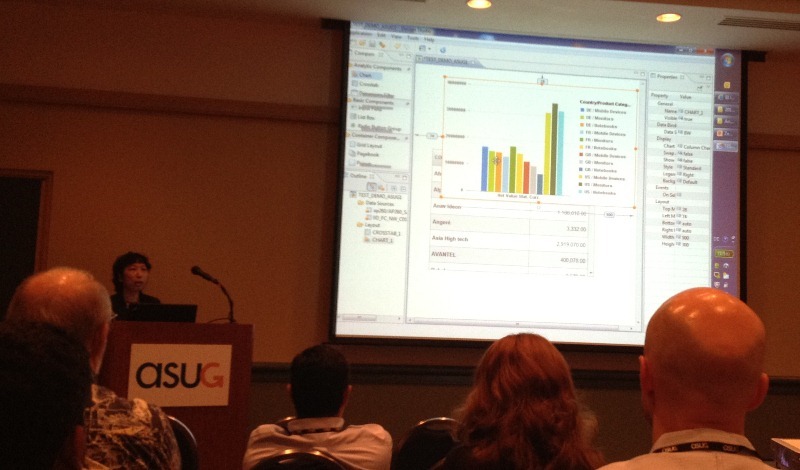 … at ASUG SAP BusinessObjects User Conference 2013 in Anaheim, California. 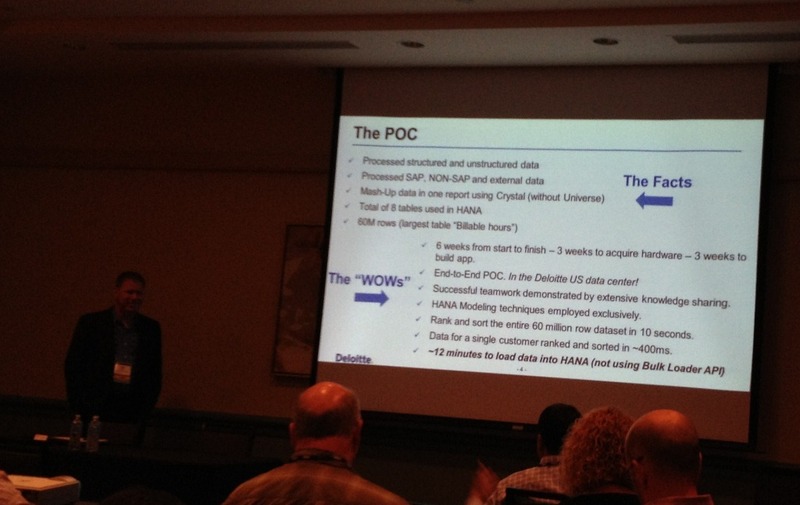 HANA vs Exalytics: Where two fight the third one wins? Or is there a fight really? Big Data and SAP HANA? 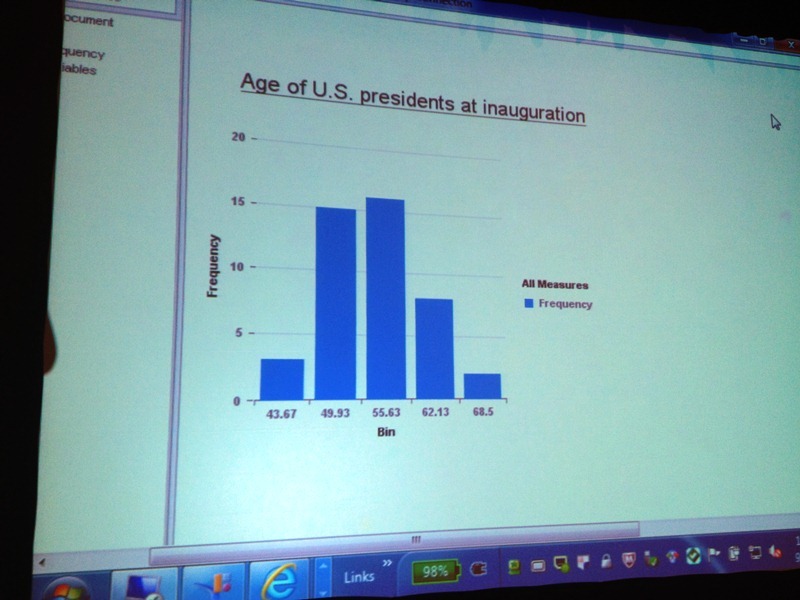 Or Sybase IQ?